Vice President Mike Pence said Wednesday the return of the remains of 55 Americans presumed dead from the Korean War was a sign of "tangible progress in our efforts to achieve peace on the Korean Peninsula." 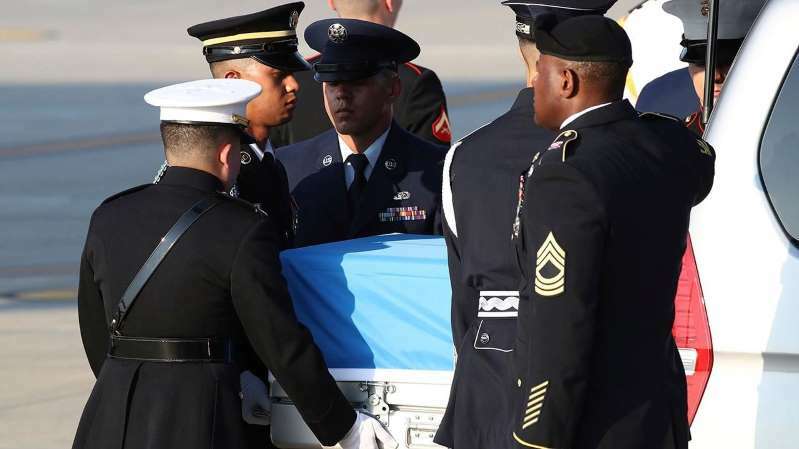 Pence spoke at a ceremony at Hawaii's Hickam Air Force Base to mark the arrival of the remains on U.S. soil and the beginning of long process to identify them. "Today, they are known but to God," said Pence, whose father fought in Korea. "But soon we will know their names and we will tell their stories of courage." [post_ads]The return of the remains was part of an agreement reached during a June summit between President Donald Trump and North Korean leader Kim Jong Un. "I know President Trump is grateful that Chairman Kim kept his word," Pence said. "But today is just a beginning, and our work will not be complete until all our fallen heroes are accounted for." North Korea handed over the remains last week. A U.S. military plane made a rare trip into North Korea to retrieve 55 cases containing the remains. Hundreds of U.S. and South Korean troops gathered for a repatriation ceremony at the Osan base in South Korea before the cases were put on military planes bound for Hawaii. After Pence spoke Wednesday, the cases were removed from C-17 transport planes and placed on stanchions in a hangar as a military band played hymns. Defense Secretary Jim Mattis said last week that the return of the 55 cases was a positive step but not a guarantee that the bones are American. At the repatriation ceremony in South Korea, the cases were draped in United Nations flags in a possible sign of that uncertainty. On Wednesday, however, the cases were draped in U.S. flags. At one point in his remarks, the vice president pointedly said "we trust" the remains belong to "American heroes who fell in the Korean War." There are 7,699 U.S. service members listed as unaccounted for from the 1950-53 Korean War, of which about 5,300 are believed to have died on North Korean soil. The remainder are those who died in South Korea but have not been recovered; those who died in air crashes at sea or on ships at sea, and some believed to have been taken to China. An armistice that ended the Korean War has yet to be replaced with a peace treaty, leaving the peninsula in a technical state of war. North Korea has argued steadfastly that its nuclear weapons are meant to neutralize alleged U.S. plans to attack it.